The perfect compliment to our Garden Classic Counter Table or placed together on the patio for a beautiful sitting area, our Amish Poly Cozi-Back Swivel Counter Chair is made with your comfort in mind! Featuring a shaped "Cozi-Back" design and contoured seat, these chairs are sure to make you and your loved ones sharing good memories for a long time! Add our optional Sunbrella cushions and throw pillows and you may not want to ever leave your seat! Each piece in our Berlin Gardens Collection is made in the United States by skilled Amish woodworkers, with the utmost attention to quality. 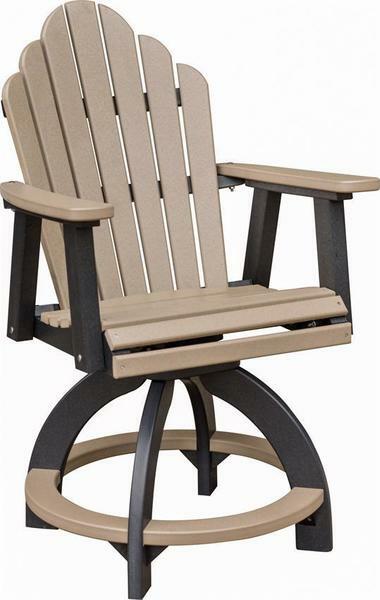 Our Amish Poly Furniture is an eco-friendly, maintenance-free choice for outdoor furniture. Each piece is available in a wide array of color and cushion options, so you're sure to find the perfect chairs to adorn you outdoor dining area! Poly Lumber, a wood substitute made from recycled materials, will not chip, crack, rot, or develop mold. It is mildew resistant and termite resistant and requires no maintenance like painting, sanding or refinishing. Just clean the Poly Lumber with soap and water or an all-purpose cleaner/bleach and water solutions if you need to take care of heavier dirt.